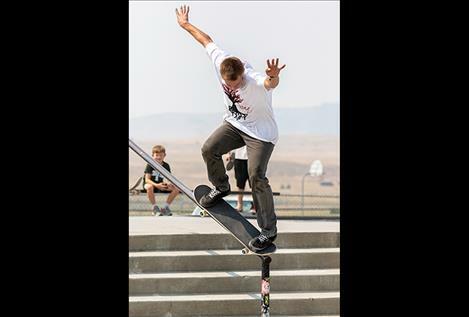 Bradley Pichler rides the rail. Liam McNamara takes a spill. Dylan Goinan flies out of the bowl. Dylan Goinan flies out of the bowl. Jesse Vargas catches some air. 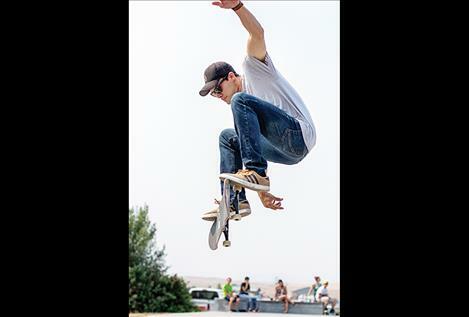 POLSON – More than 40 skaters and spectators from across Mission Valley braved the blazing heat and engaged in some friendly competition Saturday. Participants socialized and enjoyed themselves while watching fellow riders of all ages attempt to land a variety of tricks and stunts during the 22nd annual Skate Jam at the 7th Avenue Skatepark. Fueled by blaring music and shouts of encouragement from fellow skaters, the riders went all-out putting on a show of aerial tricks, jumps and grinds. Skateboarding overall has generally been a laid-back type of sport, where fellow skaters are friends as well as competitors and usually root for each other to succeed at an attempted trick. 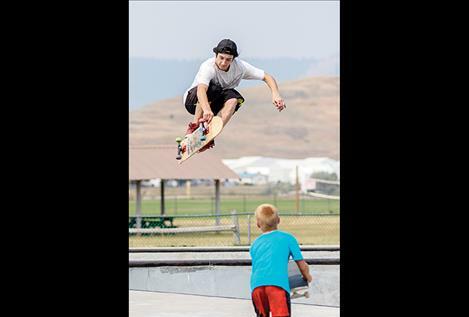 On Saturday, Bradley Pichler exemplified the skater’s vibe by taking the time out with a couple of young skaters to explain to them how to perform a trick he had just completed. 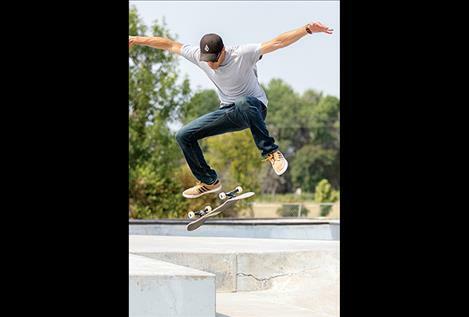 Pichler, who grew up skating at the 7th Ave Skatepark, said he enjoys passing along his knowledge. In the Hip Best Trick competitions, skaters were split into two different age categories to allow for all ages to be involved. River Kasper claimed the top spot for the 18-and-under category, followed by second place, Mons Lohof. There was a tie for third place between Alex Licano and Jordon Trombol. Pichler was tops in the 18-and-older group and Isaac Knudsen placed second while Charles Timson finished third. Among competitors in the Street Best Trick, both Jaxten Bykari and Liam McNamara tied in the 8 and under division. Kasper once again snagged first place followed by Andrew Rush and Lohof in the 18 and under category. For the 18 and older group, Dylan Goinan nabbed first place followed by Pichler in second and Timson in third.